Lovely decor, conveniently located near the entertainment/ convention center district. Easily accessible to the Interstate and wonderful ammenities. Good location; rooms in good condition. Nice recreational facilities. $6 self-park garage adjacent to hotel. Fairly new building near museums, river, etc. Nice indoor pool/spa. Excellent gym. No hairdryer in room, and staff was unable to locate one. Great location, great staff, makes you feel like a VIP. The way the staff treated me and my daughter. Location in the down town, parking, cleanliness, atmosphere, computer hook up. A bit pricey, but well worth it. 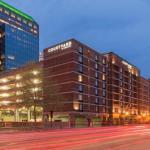 The 140-room Courtyard by Marriott Louisville Downtown provides quality accommodation at an affordable price for the business traveler and families on vacation. The eight-story, non-smoking hotel provides a complimentary airport shuttle. Other items included with the room rate are high-speed Internet access, local telephone calls, a morning newspaper and coffee available in the lobby 24/7. There are two meeting rooms available for business or social functions. The larger can accommodate 60 guests. Area landmarks and attractions include six golf courses, Waterfront Park, Louisville Slugger Museum, Louisville Glassworks, the Muhammad Ali Center, the Jim Bean Distillery and Churchill Downs, home of the Kentucky Derby. All the rooms, and eight suites, have a well-lit work desk with high-speed Internet access, television with cable movie and news channels, pay-per-view movies, in-room safe, refrigerator, wet bar, pullout sofa bed, alarm clock, tea and coffee making facilities, iron and ironing board, hairdryer and two-line telephone with voicemail and speakerphone. This hotel has an indoor swimming pool, hot tub and a fitness room on the first floor by the pool. The Courtyard Café is only open for breakfast. Restaurants nearby include Bearno's by the Bridge, Deke's Market Place Grill, Joes Crab Shack and the Old Spaghetti Factory. The 24-hour front desk has safe deposit boxes, information on local events and attractions and a list of restaurants that will deliver to the hotel. Other amenities include an ATM, copy and fax services, an airline reservation desk, coin-operated laundry, valet dry-cleaning and vending machines. Major attractions of this Courtyard are its quiet location downtown, reasonable rates and a crew of efficient and friendly employees. Business clients appreciated the two computers available for guest use in the lobby and those here to see the sights said that there were many attractions within walking distance including Louisville's new Fourth Street Live district. Parking: Yes, there is parking. It costs $ 6 per day.